09:45 Welcome to AUTOSPORT Live for coverage of the 15th round of the 2010 FIA Formula 1 world championship. The sport is back for another running of the only full night race on the calendar - the third Singapore Grand Prix at the challenging 23-turn Marina Bay circuit. Singapore's night race is already a big hit with fans around the world. Fernando Alonso won the inaugural event in 2008 in contentious circumstances and Lewis Hamilton followed up last year with a precision drive around the city streets. Both drivers will be looking to deliver again under the lights as they mount a challenge to catch Mark Webber in the title race. The cars come to life at night, exposing the wonderful aspects of our sport. The reflections glint off the bodywork of the cars, the exhaust gases are visually impressive and the bumpy nature of the circuit creates sparks to add to the visual effect. All that is to come later in the second session in full darkness. First, the drivers will conduct their normal programme of set-up, fuel load and tyre work as the sun sets over Singapore. 09:46 This evening, we will guide you through the opening practice sessions with minute-by-minute commentary as the teams and drivers begin their build-up to the race under the lights in Singapore. First practice will begin shortly, with commentary ending 15 minutes after the session has concluded. Later, after a shorter-than-normal interval, we will return at 13:15 GMT for live coverage of the second practice session. AUTOSPORT Live will end the day with a weekend weather forecast, on the Singapore Grand Prix weather page. 09:47 Mark Webber and Lewis Hamilton remain as the two leading contenders to lift the big prize at the end of the year, but with both failing to score good points two weeks ago at the Italian Grand Prix, the chasing pack of Fernando Alonso, Jenson button and Sebastian Vettel are right back in the hunt. The new points system the 2010 means that a DNF is not an option, with the gap between the top five just 24 points - less than a win. One advantage Hamilton does have over Webber is that he has been in this position before, having fought for the world championship on two previous occasions. But Webber has driven fantastically all year and has been very consistent. It is shaping up to be an intriguing battle. Ferrari raced back into form at Monza a fortnight ago and Alonso needs this upturn in fortunes to continue. He will be ably supported by team-mate Felipe Massa as the Scuderia looks to continue whittling down a 60-point deficit in the constructors' championship to current leader Red Bull Racing. 09:49 Conditions were warm and sunny this morning at Marina Bay, but the standard build-up of cloud occurred during the afternoon, delivering a thundery shower over the city-state. The storm produced a deluge at 16:00 for a time, but since then it slipped south-east and blew itself out, with no rain falling anywhere across the state since 17:00. Temperatures peaked at 32 degrees Celsius during the heat of the afternoon, but will drop a couple of degrees towards a final figure of 29 Celsius by the end of the second practice session. 09:50 Late news shortly before first practice is that Christian Klien will drive for HRT this weekend. The Austrian replaces Sakon Yamamoto, who the team say is suffering from food poisoning. This will be Klien's first race since the 2006 Italian Grand Prix. 09:51 Keep up to speed with our minute-by-minute commentary on the move with the new AUTOSPORT app. 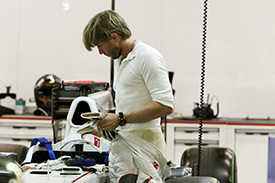 • Nick Heidfeld makes a welcome return to Formula 1 this weekend with the Sauber team. The German has spent much of the year in the Mercedes ranks as test and reserve driver. A recent spell with Pirelli as official tester makes him a valuable commodity for the Swiss team, following its difficult season. • GP2 driver Jerome D'Ambrosio makes his Friday debut with the Virgin Racing outfit this weekend. He will undertake a similar role to that occupied by Paul di Resta at Force India, lapping the circuit and gathering data for the team. The Belgian will replace Lucas di Grassi in the first session. • The Marina Bay circuit has been slightly modified since last year's event. Several bumps have been flattened out and the pitlane asphalt has been lowered by one centimetre. 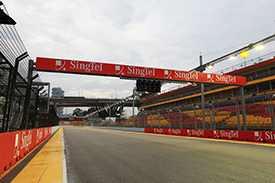 The 'Singapore sling' chicane at Turn 10 is now angled differently to make it slightly easier for the drivers. This should improve lap times very slightly. Around the circuit, many of the walls have also been painted to improve the visual effect. • Former Formula 1 driver and 1985 Indianapolis 500 'spin and win' victor Danny Sullivan is again on the panel of FIA stewards this weekend. The American joins the panel for the second time, having first appeared at the German Grand Prix in July. 1 min: There are five minutes to go until the engines roar once again at the Marina Bay circuit. 09:57 The track temperature is 27 Celsius as the sun shines down and continues to dry out the track. 09:58 Jerome D'Ambrosio is already in the Virgin Racing entry and ready to join the track when the session opens. 0 min: The practice session is underway. 0 min: Kovalainen is straight out of the pits in his Lotus and is joined by Kobayashi in the Sauber. 1 min: Tonio Liuzzi and Jaime Alguersuari join the early runners on track. 2 min: Intermediates are the tyre of choice for a gentle installation lap on the damp circuit. 2 min: Klien is joined on track by Hulkenberg, Sutil, Senna, Barrichello and Rosberg for the installation laps. 3 min: Lewis Hamilton is making his way around the circuit, which is still quite wet in parts. 4 min: Liuzzi continues across the line to begin a second tour in the Force India. 5 min: Hamilton continues on for a second tour, feeling out the grip levels around the circuit. 5 min: Mark Webber joins the race track in the Red Bull Renault. Sebastien Buemi is also out. 5 min: Liuzzi completed two slow laps and has returned to the pits. 6 min: Michael Schumacher and Sebastian Vettel are the only two drivers yet to come out. 6 min: Drivers report slippery conditions as they return to the pits for the cars to be checked over. 6 min: Schumacher comes out in the Mercedes to check the testing conditions. 7 min: Sebastian Vettel is also on track, but will quickly find out that there are large areas of standing water around the circuit. 8 min: Admittedly, there are some dry sections, but intermediates is the only tyre choice at the moment. 9 min: Fairuz Fauzy is handling driving duties for Lotus in place of Jarno Trulli for this first session. He has now completed an installation lap. 9 min: Schumacher returned to the pits after a single tour of the circuit. Buemi has continued round for a second lap. 10 min: Vettel brings his Red Bull Renault into the pits after just one tour. 10 min: Jenson Button is one of the last to complete his installation tour. 11 min: Buemi is also back into the pits after a two-lap installation run, leaving the circuit empty for the moment. 11 min: The track looks tricky in places, with the street furniture such as painted lines and kerbs particularly slippery in the damp conditions. 11 min: In the pit garages, the data downloads continue. Buemi remains in the Toro Rosso for the moment. 12 min: Robert Kubica is back out in his Renault. 12 min: Williams drivers Rubens Barrichello and Nico Hulkenberg have both walked across to the pit gantry to talk with the engineers. 13 min: Nico Rosberg remains in the cockpit of his Mercedes, while Michael Schumacher wanders out of the back of the garage. 14 min: Robert Kubica is back into the pits after another checking lap. 15 min: Replays show that Kubica bumped wildly over the kerbs at the Turn 10 'Singapore sling' section. He was able to regain control of the car after missing the exit. 16 min: Mark Webber is out on the circuit to check over the condition of his car after the initial installation lap. Christian Klien also joins the track for the second time in the HRT. 17 min: Webber is back into the pits after a second single lap of Marina Bay. He completed that lap on intermediate tyres. 17 min: Vitaly Petrov is out for another look around the track as he tries to learn the circuit. 18 min: The weather radar remains clear of showers. We anticipate no rain during this session. 19 min: There are still plenty of damp patches around the circuit, making it unsuitable for slick tyres at the moment. 19 min: Klien crosses the line and begins a timed lap. The Austrian is understandably taking things gingerly, as the circuit is still wet in places. 20 min: Klien completes the first timed lap of the weekend. He posts 2m18.621s. 21 min: Hamilton has stepped out of his McLaren and doesn't look keen to run again until the track dries out. 22 min: Alonso is out for another couple of installation laps in his Ferrari. 22 min: Michael Schumacher and Sebastien Buemi come out for another look at the conditions. 22 min: Petrov is now on top of the early times with his first effort of 2m14.791s. 23 min: Klien is sensibly easing his way into the circuit condition. He improves to a 2m14.791s to retake the top spot away from Petrov. 24 min: Petrov is being very careful in the tricky conditions as he finds his way around the winding street circuit. His latest time is a 2m09.423s. 25 min: Michael Schumacher is now on a timed lap, as Klien improves again with 2m11.462s. He stays in second position. 26 min: Schumacher is on intermediate tyres and is coming through to complete his first effort. He posts 2m09.922s to slot into second position, behind Petrov. 26 min: Petrov improves to a 2m07.277s benchmark time. 27 min: Sebastian Vettel has joined the racetrack in his Red Bull. Schumacher negotiates his way through the Turn 10 chicane as he comes towards the end of his second timed lap. 28 min: Buemi posts 2m10.783s in the Toro Rosso to go third fastest at this stage. 28 min: Schumacher completes that lap in 2m06.176s to top the order, ahead of Petrov. 28 min: This damp pace is well off the 1m46s laps achieved in qualifying last year. The circuit will also need time to rubber in once it dries out. 30 min: Timo Glock is on track for Virgin, testing the limits of the damp circuit. The German was very strong for Toyota here last year. 31 min: Schumacher remains out on track, as he continues to learn the Marina Bay circuit. He improves to a 2m04.758s. 31 min: Glock has slotted in second quickest, 0.379s slower than Schumacher. 31 min: Nico Hulkenberg and Bruno Senna join the racetrack, as more drivers come out to post their first laps on the board. 32 min: Glock tops the times with a 2m03.286s, pushing the Virgin hard with some moments of oversteer. 32 min: Rubens Barrichello is also on the track, as Williams looks to gather early data. 33 min: Darkness is slowly closing in overhead, with the floodlights beginning to take over illuminating the track. 34 min: Heidfeld is back out to start his first run on his return to Sauber. 35 min: Hulkenberg and Barrichello are both on timed laps. Schumacher is continuing to lap the circuit, but has so far not improved on his earlier mark of 2m04.758s. 35 min: Hulkenberg goes fourth with his first effort of the day - 2m09.525s. 36 min: Bruno Senna manages a slow 2m13.086s and is eighth at this stage. 36 min: Massa is testing his Ferrari without the F-duct, clocking a 2m06.485s to go fifth quickest. 37 min: Glock continues to improve the benchmark as he presses on in the Virgin as the track dries out. A 2m02.180s is now the time to beat. 37 min: Rubens Barrichello goes third in the standings, behind Glock and Schumacher, with a time of 2m05.674s. 37 min: Hulkenberg takes over third position from his team-mate, with a lap of 2m05.379s. 38 min: Jaime Alguersuari is now on the circuit for his first run of the evening. 38 min: Jerome D'Ambrosio is feeling his way into an F1 weekend for the first time and is now on par with Senna's HRT with a lap in the 2m11s. 39 min: Michael Schumacher lowered his best time to a 203.933s and remains second to Glock. Schumacher then pitted to bring the first run to an end. 40 min: Alguersuari slots into fourth position with a lap of 2m04.617s. 41 min: Rubens Barrichello goes second to Glock with a time of 2m02.297s. The gap between them is 0.117s. 42 min: Hulkenberg is now third in the classification behind his team-mate, with a lap of 2m02.610s. 42 min: Heidfeld is up to eighth quickest as he gets used to the 2010 Sauber for the first time. 42 min: McLaren report that Jenson Button is enjoying a cup of tea as he waits for track conditions to improve. 43 min: Barrichello states on the Williams team radio that he is experiencing some rear tyre locking. He is requested to lay some rubber down in the pitbox at the end of his run, but is reminded that the pitlane is very slippery. 44 min: Alguersuari is now fourth, with a lap of 2m03.635s, as we see Senna exploring the limits of the circuit. The Brazilian takes to the run-off area, but spin-turns the HRT and is able to continue. 45 min: Alguersuari goes quickest with a lap of 2m00.655s, ahead of Glock and Barrichello. 45 min: The track continues to dry, but there are still some odd damp patches that could be tricky on slick tyres. 46 min: Alguersuari is set to go quicker still on this latest lap, but the Spaniard comes into the pits, bringing that run to an end. 47 min: Schumacher is back out on the circuit for his second run of laps in the Mercedes. The German is eighth in the standings currently. 47 min: Kobayashi improves to fourth quickest as the Sauber pair continue to lap. Heidfeld is up to sixth as he heads to the garage. 48 min: Tonio Liuzzi and Adrian Sutil come out in the pair of Force Indias. Both will be looking to go near the top of the order. 49 min: Kobayashi puts his Sauber on top of the times as he breaks under two minutes with a 1m59.900s. 50 min: Replays show Alguersuari bouncing wildly over the Turn 10 kerbs as his Toro Rosso briefly gets airborne. The Spaniard has been in the pits for a few minutes. 51 min: Michael Schumacher slots into second place with a lap of 2m00.098s. He is now 0.198s shy of Kobayashi's quickest time. 51 min: Massa is back out to collect some data for Ferrari without the F-duct on his car. He's up to fifth qucikest with a 2m00.763s. 51 min: Liuzzi goes 10th with his first effort of the weekend - 2m03.780s. 52 min: Adrian Sutil will soon complete his first timed lap of the day. He does, but it is a sedate 2m12.387s. That puts him last of the 15 runners to set a time so far. 53 min: Petrov is the next man to grab the top time with a 1m59.856s effort from the Russian. 53 min: Liuzzi is up to sixth position with a lap of 2m01.562s. Petrov continues to lead the field, ahead of Kobayashi, Schumacher and Alguersuari. 54 min: Adrian Sutil takes over sixth place from team-mate Liuzzi, with a lap of 2m01.478s. 54 min: Kobayashi takes the benchmark back again as the track dries rapidly. A 1m58.947s is the new time to beat. 55 min: Schumacher has slipped to third position in the standings, but is now on his quickest lap of the day so far. 55 min: Liuzzi moves up two places to fourth with a lap of 2m00.646s, as he continues to improve. 56 min: Adrian Sutil takes over third position with a lap of 1m59.975s. 56 min: Michael Schumacher moves to the top of the order, after posting 1m58.504s in the Mercedes. 57 min: Conditions appear to be close to slick tyres now, which should prompt a flurry of activity after the first man makes it work. 57 min: The Force India drivers, Schumacher and Kobayashi are providing much of the entertainment for the large crowd around the circuit. 59 min: Liuzzi takes over third position with a lap of 1m59.614s, but he is quickly demoted to fourth by his team-mate Sutil, who posts a lap one-tenth of the second quicker. 60 min: Jaime Alguersuari is back out on the circuit, for his second run of the evening. He is currently sixth in the standings. 61 min: Glock has slick tyres on his Virgin. 61 min: With half-an-hour remaining in the first practice session, Kobayashi leads the field with a time of 1m57.914s, with Schumacher second, Sutil third, Liuzzi fourth and Petrov in fifth position. 62 min: Alguersuari is also testing out the slick tyres. He is using the hard compound for this run and is on a timed lap. 63 min: Alguersuari's sector times are two seconds shy of the best so far. He completes the lap in 2m05s, some way off Kobayashi's benchmark. 63 min: Massa is back out with worn intermediates on his Ferrari. 64 min: The teams will be carefully monitoring Alguersuari's performance, as he continues for another lap on slicks. Again, the Spaniard is two seconds off in the first sector of the circuit. 65 min: Alguersuari is getting closer in the second sector. He continues round with no improvement, but a third timed lap should bring him much nearer to the front. 66 min: Massa just escapes a moment at Turn 7 to move up to third quickest on his intermediates. 66 min: Alguersuari is 1.4 seconds off Kobayashi's mark in the first sector. Clearly, the Spaniard is struggling to keep the heat in his slick tyres, thanks to running through the wetter parts of the circuit. 67 min: Kobayashi still has intermediates on his Sauber but has been exploring the wet areas to the outside of the circuit. 67 min: Alonso is now on track with hard compound slicks on his Ferrari. 69 min: Alguersuari is still unable to match the best first sector time set by Kobayashi. But he is now the quickest man through the second sector. This is highly valuable information for the rest of the teams, as the Spaniard continues to hammer round the circuit. 69 min: Alonso is warming up towards a flying lap on slicks, with darkness now setting in overhead. 70 min: Alguersuari completes that lap and improves with a 1m58.974s to go third fastest. He is 1.7 seconds off Kobayashi's benchmark. 70 min: On the next lap, Alguersuari is less than one second off Kobayashi in the first sector, but again sets the fastest time in the middle portion of the lap. 70 min: Alonso is taking it very easy on his first flyer as the Spaniard feels out the grip levels around the circuit. 71 min: The Toro Rosso driver completes that lap in 1m57.904s to move into second position. 72 min: Alonso pits after a slow lap to collect some aerodynamic data. He is taking on a different front wing for another test. 72 min: Alguersuari has backed off on his latest lap. He may elect to pit, having given his team (and everyone else) great information. 73 min: Glock has improves to fifth quickest on his slicks, but has just been down an escape road. He's back underway after a spin turn. 73 min: Alguersuari indeed pits, bringing that run of laps to an end. Kobayashi remains fastest, with Alguersuari second, Schumacher third and Massa fourth. 74 min: Barrichello is now out on slick tyres. He will also have to build up his speed in the tricky conditions. 75 min: Still no move yet from the Red Bull drivers. We expect Webber and Vettel to emerge towards the end of the session. 75 min: Kovalainen and Fauzy clock their first times of the session, going 13th and 17th respectively. 75 min: Rosberg and Schumacher are both on track for Mercedes, as Barrichello completes his first timed lap on slick tyres, with no improvement. 76 min: Massa is lapping again with extremely worn intermediates on his car. He's up to second quickest now as he makes that used rubber work well. 77 min: Vettel comes out for his first serious run of the weekend. 77 min: Adrian Sutil brings the Force India back out onto the track for another run of laps. The German is sixth in the standings currently. 77 min: Hamilton and Button are finally out in the McLarens for runs on slicks. 78 min: Mark Webber is also on track now, as Vettel crosses the line to begin his first timed lap. 79 min: Replays show Michael Schumacher suffering a loss of traction as he tries to find grip with the slick tyres. Schumacher is currently fourth, behind Kobayashi, Massa and Alguersuari. 79 min: The track is very busy now as conditions finally come to the slick tyres with just over 10 minutes remaining. 80 min: Vettel is coming round to complete his first timed lap. It is a slow 2m07.594s, but that will quickly improve. 82 min: Hamilton clocks his first time of the session with a 2m02.454s to slot in 12th. 82 min: Rubens Barrichello reports on the Williams team radio that he is still experiencing rear locking everywhere on the circuit, and that the feeling is 'lazy' with the car's response to his input. 82 min: Button springs up to third quickest with his latest effort of 1m57.872s. 83 min: Many drivers are now on track, and Webber is on his second timed lap, having gone 12th with 2m02.304s on his first effort. 83 min: Button is pushing on and is now fastest through the middle sector. 83 min: Schumacher is up to second place with a lap of 1m57.757s as widespread improvements are posted. 84 min: Button finally tops Kobayashi's earlier time with a 1m56.228s now the time to beat. 84 min: Adrian Sutil now takes over second position with a lap of 1m57.403s and Vettel also moves up to seventh place. 84 min: Mark Webber was held up by traffic on his second timed lap, and was unable to improve. He has slipped to 17th in the standings, but should move up imminently. 85 min: Kubica is finally back on track after spending a lot of time in the garage. He hasn't set a time in this session so far. 86 min: Adrian Sutil goes fastest of all with a lap of 1m56.226s, demoting Button to second. 86 min: Alonso is also out, having also failed to set a time so far despite nine laps of slow aerodynamic testing. 86 min: The order is changing quickly at the top. Sutil now leads the pack, ahead of Button, Barrichello, Alguersuari and now Webber up to fifth with a lap of 1m56.831s. 86 min: The track is very busy now. Hamilton has popped through the pits and is back out in clear air behind Vettel on the road. 87 min: Massa has finally discarded his intermediates and is out on his set of slicks. 88 min: Up front, Button sets the fastest middle sector and still topples Sutil despite finding traffic in the final part of the lap. 88 min: Sebastian Vettel is on a much better lap. He crosses the line to go fastest with a lap of 1m55.137s as Red Bull moves to the top. 89 min: The track is still lacking grip, with the pace well off the 1m46s laps in qualifying last year. 89 min: Alguersuari and Webber are both on improving laps. The Spaniard crosses the line to move up to second position, behind Vettel, with a lap of 1m55.160s. 90 min: The flag is out to close first practice in Singapore. 11:30 Webber completes that lap, but does not manage to improve his time, having encountered heavy traffic. He slips to eighth. 11:30 Hamilton takes 10th quickest with his final flyer of 1m56.884s. 11:31 Liuzzi is up to fourth with his final lap of the session. He posts 1m55.510s. 11:31 Schumacher takes over at the top of the tree with a lap of 1m54.708s as the final laps are posted. 11:32 Webber just managed to sneak over the line to begin a final time the lap before the flag came out. He posts 1m54.589s to top the session. 11:33 The order changed quickly in the final minutes as the grip level improved. 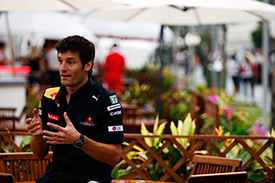 Webber tops the session for Red Bull Racing. 11:34 On his lap into the pits, Vettel posted the fastest second sector time at 43.1 seconds. The Red Bulls will aim to top the second session later this evening. 11:35 Michael Schumacher finished second to Webber, with Sutil third, Vettel fourth and Alguersuari in fifth. 11:36 Jenson Button was sixth in the first of the McLarens, ahead of Liuzzi seventh and Buemi eighth. 11:36 Renault drivers Robert Kubica and Vitaly Petrov were ninth and 10th, with Alonso the first Ferrari in 11th. 11:37 A difficult session for the teams with ever-changing track conditions. The afternoon rainstorm certainly did not help matters, but the teams will hope for a fully dry session later tonight. 11:40 Thanks to the conditions, it is impossible to get a read on the pecking order after the first session. Both Red Bull drivers looked good in the final stages, as did Adrian Sutil in the Force India. A few drivers decided that it wasn't worth risking the car in such conditions. Rosberg, and Hamilton, for example completed less than 10 laps of the circuit. Will Red Bull stay on top in tonight's second session? Join us at 13:15 GMT for continuing coverage from Marina Bay.